talked with friends and family, and had time to enjoy the beauty of nature and thewater. 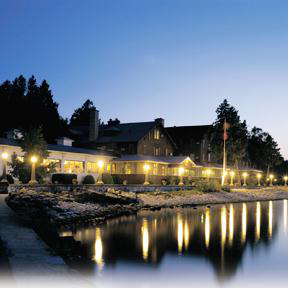 This is a classic resort in Door County! Call to make your reservation today! Alpine Resort opened its doors in 1922, when many of its guests arrived by steamers from the big cities. A couple of shuffleboard courts on near the water’s edge remind you of classic times, of comfort and fun. Situated on 300 acres, Alpine stretches along the waters of Egg Harbor, providing fabulous views of the shimmery waters and historic town. There is no other place like this in Egg Harbor, and the calmness, beauty, and charm of being right on the water is a simple delight. Hof Restaurant is on the premises as well. And they schedule lots of activities in summer too and have 36 holes of wonderful and challenging golf. Open May - October. With 40 rooms, 30 cottages and 12 homes (from 1 – 5 bedrooms), you can find accommodations that match your needs and desires. When you enter the main area, you immediately feel tradition. The Tyrolean Room, for example, has a seating area, a dance floor which I am sure holds many a tale, and cases and cases of memorabilia like Bill Bertschinger’s (second generation owner) toy trains, old cameras, porcelain figurines, eyeglasses from an era gone by, antique soda and beer bottles and dozens of other things that tell a story and make for interesting study. The room overlooks the water, and tables flank the dance floor, and an old upright piano sits against a wall – can you hear the music? We toured sample rooms in the main building, and a couple of the cottages as well. 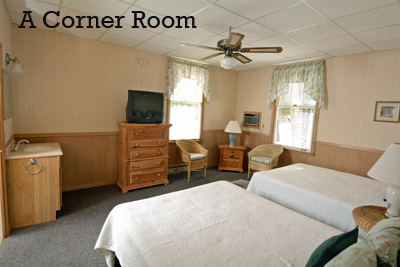 The resort also offers many amenities like an outdoor heated swimming pool, tennis, sand beach, boating, fishing, bikes for guest usage, and a game room in July and August. And, of course, 36 spectacular holes to golf! See our golf course review for lots more detail. And dine at the Hof Restaurant, whose dining room and bar area overlooks the water of Egg Harbor – an awesome view. We enjoyed strolling around the grounds – it is a tranquil and soothing environment. First we toured the rooms in the main lodge. The hallways on the way to the rooms were tastefully wallpapered above and below the chair rail. This simple room has 2 double beds with floral quilts, striped floral wallpaper with wainscoting below, carpeted floor, 2 country wicker chairs, a TV and dresser. The bathroom has a stand-up Euro-style shower, and is simple and functional. We went upstairs to get a view of the second floor rooms. In this room, a queen bed draped in floral bed clothes, faced a window, with a second window to its left looking out at the water! Floral striped wallpaper in creams/blues/roses added charm to the room, with wainscoting below; a TV sat upon a beautiful antique dresser. Add a couple of chairs and a wicker table, and the room is complete. The bathroom is small, simple and functional. When I walked in, I thought the room felt familiar – and it was. This reviewer spent his honeymoon at the Alpine, and stayed in this very room! We headed up to the third floor to take a peak from atop. Enter a small sitting room with a plaid loveseat, dresser, 2 wicker chairs and table, and bright windows. To the right is the bedroom, which sported striped yellow/green wallpaper, a coordinated bedspread with floral panels, coordinating curtains over the windows. The bathroom had a stand-up Euro-style shower, tiled half way up, with gold/white Malonite – board above. A wicker headboard added a nice touch, and a ceiling fan can cool you on warm summer nights. The rooms all were clean, very functional and accommodating. Don’t look for hot-tubs, whirlpools and fireplaces. This is classic old-world resorting, at its best. And it’s a lot of fun! Nest we strolled outside along the water past a pleasant grouping of cottages named after our U.S. States. Here we passed the shuffleboard courts, and looked at the town of Egg Harbor across the bay and the glistening water. Enter a small screened-in porch, then into the small living room area with a plaid loveseat, table and chairs, TV, fridge, coffeemaker and sink. Ahead, is the bathroom, with a tub/shower combination, and painted bead board walls. To the right is a bedroom with both a double bed and a single bed, done up in a nautical/lighthouse theme. Oklahoma, you’re OK! From Oklahoma, we walked to Indiana (pretty short walk actually)! Again, you walk into a small screened-in porch, then into a sitting area with a plaid loveseat, table and 2 chairs, carpeting, and painted bead board walls, a fridge, sink and coffeemaker. The bathroom had another tub/shower combination. This 2-bedroom cottage can sleep about 5. Bedroom One had a double bed and a twin bed, done in the same nautical/lighthouse them as Oklahoma. Bedroom Two supplied two twin beds, in the same theme. Both rooms were a nice size, and had white painted bead board walls. If you like cottages, you will like the Alpine cottages for sure. And if you want a cottage that faces the water, then take a look at Ohio, Illinois, Nebraska, California and Maryland. If you like classic resorts, you will love the feel of the Alpine – you just feel comfortable here. We have heard from users from time to time who keep returning to the Alpine, year after year, and generation after generation (remember, it was originally built in 1922). Alpine says, “Discover the charm” - we think that sums it up pretty well. Check out their wonderful Alpine Resort website for more information, rates and more. Be sure to tell them that DoorCountyNavigator.com sent you - thanks! And please refer to their Property ID # DCN-3232! Have fun!